It has been a long time astronomers have known that there is a supermassive black hole—called Sagittarius A*—at the center of our home galaxy. Now, a group of astronomers have claimed that they have spotted another one, but not quite as big as Sagittarius A*, circling 200 light-years from the center of the Milky Way. 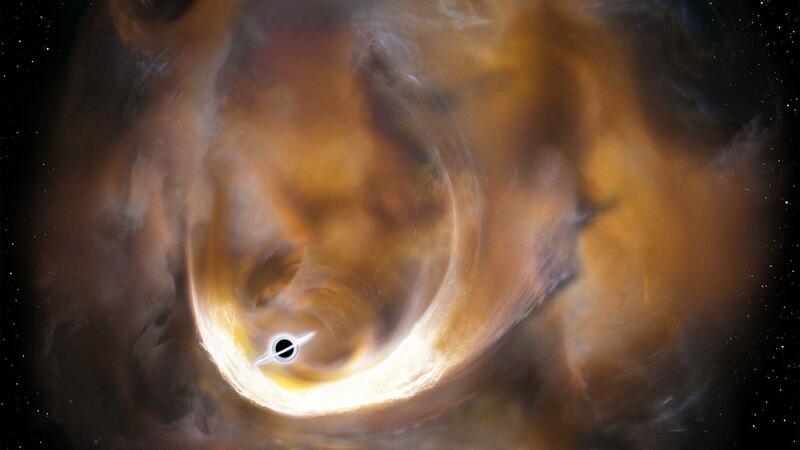 Astronomer were not actually looking for a black hole. They were using the National Astronomical Observatory of Japan’s 45-meter Nobeyama radio telescope to observe and study a mysterious gas cloud called CO-0.40-0.22, that’s when something strange caught their eye: an unusually extensive range of speeds in the cloud’s gas molecules, signifying that something pretty gigantic is accelerating them. Observations at x-ray and infrared wavelengths, so far, didn’t disclose any big objects in the cloud. As the astronomers explainin Astrophysical Journal Letters, a simulation of the gas movement in the cloud recommended the source was a dense object 0.3 light-years across with a mass nearly 100,000 times that of our sun. So the best explanation astronomers could come with for such a massive object, which doesn’t appear at other wavelengths, is an intermediate-mass black hole (as imagined by an artist, above). Astronomers have long anticipated the presence of black holes bigger than those made from single stars, but smaller than the million or billion solar mass ones lurking at the very centers of major galaxies. But so far astronomers have a very little indicationfor their presence. If CO-0.40-0.22 does verify to comprise such an object, it will be a rare beast, certainly, and just right in our backyard.